There was no attempt to look for excuses or sidestep any questions. 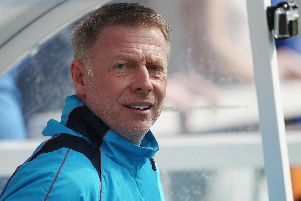 Trevor Carson told us what we all saw – Hartlepool United are not good enough at the moment. Pools were beaten 2-0 at Wimbledon, where, but for the heroics of the Pools keeper, the scale of the defeat could have been considerably worse. Ronnie Moore and his side were not helped by a depleted squad. They lost Luke Hendrie before they even arrived in the capital – the right-back was forced to go back to Burnley with an ankle ligament injury. Magnus Okuonghae limped off in the 37th minute with ankle trouble and with no defender on the bench due to injuries and suspensions, Pools had to re-organise their back four again with Dan Jones joining Matthew Bates in the middle of the defence and Jake Carroll dropping in at left-back from wide midfield. All the chopping and changing did not help and with the score at 80 minutes they had penalty appeals turned down when Nicky Featherstone went tumbling in the box. A successful spot-kick at that point and who knows what might have happened. But Carson insisted there can be no excuses for a poor display. “Obviously we had worked on a set back four in training,” he said. “It did change but for me it’s an excuse. “If I am on the bench and I get to come on I’d be buzzing to get out there, ‘this is my chance’ that type of thing. “You can say that we’re not used to that combination, you can say we should have had a penalty, but it’s papering over the fact we weren’t good enough, it’s as simple as that. “We all know we need to improve. “If any lads think that was acceptable then we are going to struggle. Pools, of course, went through a relegation fight last season and Carson actually went down with Cheltenham Town. The Northern Ireland international does not want to go through another season of torture and says actions need to speak louder than words. “I’ve been there before and I’ve been in losing runs where we sit in the dressing room after and say the right things and how ‘we’ll put it right next week’ and then go and get beaten again,” he said. “We can’t be that team. “We found ourselves out of the league last year at Cheltenham. “I’ve said that to the lads here that we have to be looking up, not over our shoulders. “I’ve told them ‘none of you want a relegation out of the football league on your CV’. “If it happens and players are look for new clubs they will find it hard. It’s a massive dent on your CV, no-one should want that. “I’ve explained to the lads what a horrible feeling going out of the Football League is. “We don’t want to be there and hopefully this is a wake-up call for us. “It’s horrible even just talking in these terms when you think of the quality we have in this squad. “But quality counts for nothing if you are not picking up wins or points. Carson made stop after stop, including something of a wonder save when he kept out Dannie Bulman’s shot from point-blank range after Lyle Taylor hit the post with a 74th-minute penalty. “There’s no satisfaction from my own performance really,” said a modest 27-year-old. “In the second half I made a few saves and I kept out the rebound from the penalty. “But it was more a case of how did he miss it really? “I got up and stopped it.